Lovely home situated in well established neighborhood w/mature tree lined streets & close by to shopping, dining, downtown & I-95. 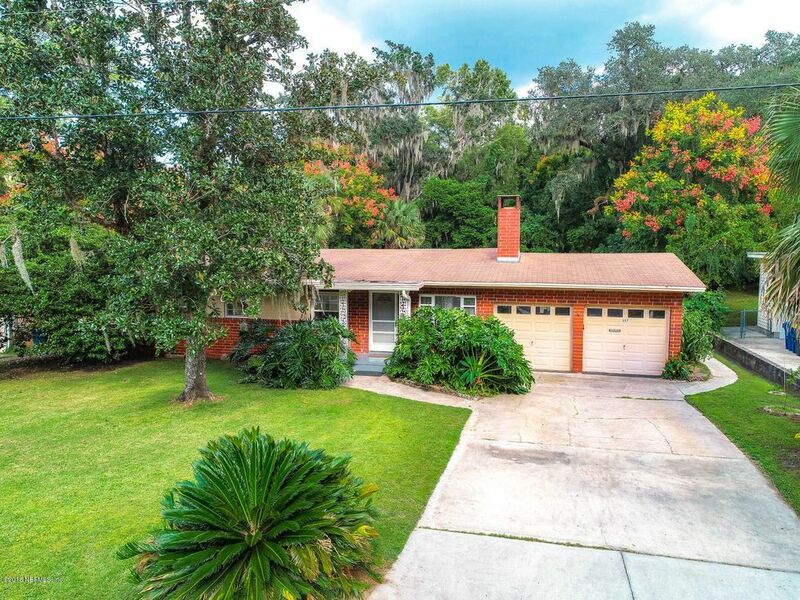 Seller purchased the lot abutting to back yard which includes water on a tidal canal providing access to Strawberry Creek which leads to the St Johns River & Atlantic Ocean! Inside you will find hardwood floors, wood burning fireplace, spacious dining area overlooking large FL Rm w/wall unit. Kitchen is fully equipped & overlooks back yard to keep an eye on kiddos playing outside! Bedrooms are spacious & master has en suite bathroom.There is hardwood under carpet in bedrooms.Private setting and good sized yard, 2 CG; storage area, covered area out back great for grilling area & patio furniture. Lots of fruit trees too! New HVAC just installed! Some of the plants in back yard - Pumpkin, Blackberry, Blueberry, Plum, Olive, Fig, Apple, Peach, Eggplant, Mulberry, Hickory, Loquat, Bamboo & Bitter Melon. Fenced in area in back yard off sunroom was for past family pooch. Can be easily removed. The sunroom that leads from the dining room has a wall unit installed and opened to main house - 340sf of the total SF is to account for that room & SF. The garage is the size of a 2 car garage however the left side can not hold a car due to fireplace location. Directions: Head north on Arlington Rd. from Atlantic Blvd, t/l at light on Oakwood Dr, t/r on Tidewater Cir E., house on right.